I want to thank Tim Montgomerie and Sam Coates for the opportunity they gave me to write a column for ConHome this year. Partly, this chance was afforded me because Tim knows I have been a Cameroon voice on the site for some time, under both my own name and pseudonyms, and because the editors wish to recognise Conservatives who represent the full range of party opinion. But in considering myself a Cameroon, I remain, as I have always been, a Thatcherite. When submitting myself for selection I was lucky enough to be able to include quotes from friends who had known me since university, and who could attest to my profound hero worship of the greatest woman statesman. I am in an odd position; in that I have a number of friends from political families, I have several acquaintances who know Lady Thatcher socially. I can not, and likely will never, make that boast. I do not know Lady Thatcher. But politically, I worship her. I never had any doubt as to how my column on Conservative Home should end. Posters on this site should not worry when the media spins to them that Cameroon, modern compassionate Conservative MPs and candidates, want to distance themselves from Lady Thatcher. This is nonsense; I do not wish to distance myself. I wish instead merely to touch the hem of her garment. How can I express my gratitude to the greatest living Conservative and politician? I was born in 1971, born when my father was forced by punitive taxation to look at emigrating, and persuaded against it by my mother on the grounds that walks in the English countryside were always free. I was born into a world where strike-ridden Britain was perceived to be in permanent decline. I was born into a world where the idea of social justice was capitulation to the unions and pacifism abroad even in the face of aggression. I was born into a world where over-employment seemed a fact of life and the Foreign Office was telling the PM her job was to “manage Britain’s decline”. BM (Before Margaret) we were taking loans from the IMF, like the proverbial banana republic. We were a charity case, an afterthought. We were quite simply losers. Louise Bagshawe: Save the Gordon! Merry Christmas to all, especially fellow Conservatives. It’s easy to live the season to be jolly when you’re hitting a steady 40% in most polls. And this time of year, we feel a particular need to be kind to the weak and helpless. Can we please prevail on cchq to mount a festive campaign to Save the Gordon? Just think. Weak polls from Ming Campbell, following his many love-ins with Gordon Brown, and we harried him in office. He’s gone and the LibDems have Calamity Clegg. They have soared from eleven points to a mighty 14! Beware the new leader bounce! Confession is good for the soul, so here goes; I felt a little stupid back in August. Months of polls showing a widening of our lead with Mr. Bean in charge, which I believed were accurate, were replaced with very different non-hypothetical numbers once he had actually kissed hands; Cameron down for the first time since his election. So what happened? Well, it seems those named leader polls, as PoliticalBetting pointed out this week, were accurate – but only after the new leader honeymoon had gone. Following wild highs and lows, they have settled for Gordon as predicted. But if there is any iron law in politics, I’ve learned the hard way it’s that a new leader, no matter who, will get a bounce. Do we want Gordon Brown out? I’m certain we could get him out. But why do it? The man should be up for one of Tim’s Conservative Politicians of the Year awards. No, no. Save the Gordon! True, people are heartily sick of the whole Labour government. Miliband, with his smirk, signing away our rights in Brussels. Jack Straw hectoring. Darling’s lack of shame. Even Gwyneth Dunwoody, Labour stalwart, is calling this Government of No Talents cynical and shameless. But Gordon Brown is the icing on the Labour disaster. We must not repeat the Ming episode. I take back all the cruel things I have said about Gordon in this column. He is a one-man Tory vote getting machine! Opinion polls are making enjoyable reading at the moment, aren’t they? The last one gave David Cameron, on the swing, a decent workable majority. But what’s interesting to me is delving into the individual seats we need to win in order to get that majority. One of the greatest attractions of Anthony Wells’ Polling Report site is its constituency by constituency analysis. If you’re a true political anorak (guilty, m’lud) you may while away some time reading around the supposedly difficult seats and reading lots of comments that doubt the Tories can take them. Yet on UNS, those seats fall like dominoes. There are a couple of ways of looking at this. The first is to acknowledge the axiom that a candidate really doesn’t make all that much difference in a general election, at least not on the positive side. If a candidate mis-steps they can lose the seat, but a positive effect seems to be capped, in conventional wisdom, at an absolute maximum of two thousand votes. Along with this, we must take note of what I believe Sean Fear called the “special pleading” effect, where local factors seem to weigh more heavily in the eye of the local beholder than they actually do in a general election; all kinds of Tory MPs in “we can’t lose here” seats with good personal reputations nevertheless were washed away by the massive Labour swing in ’97. Fair enough. I acknowledge both those factors. But the difference between overall power and a hung parliament will be made by PPCs and local activists in “difficult but winnable” seats, seats where, if you analyse them, there are structural problems – perhaps some councillor losses, perhaps a large Labour/LibDem majority. We still have to take those seats, and plenty of them, for David Cameron to win a working majority. And in order to win these seats, which I call “goalpost seats”, we’re going to have to be creative. We need to be Heineken Tories – refreshing the voters other Tories cannot reach. How is this to be achieved? Well, candidate selection is one part of it. Associations are picking modern, dynamic, likeable PPCs, and this has picked up good press. But I think there is a campaign strategy that will work well. No, this isn’t a scene from “Goodfellas”. But would you like a spot of wholly metaphorical grave-digging? The Labour Government are trying to use their own legal problems to bury bad news. We shouldn’t let them. The crises of recent days have offered Brown the proverbial silver lining to the multiple clouds that lour across his house. So obsessed are the press with the latest twists and turns of donorgate (try: Labour’s dodgy donations to be confiscated by the Electoral Commission, except they can’t pay them back, yet Culture Minister/Photoshop Hero James Purnell falsely states on Sunday that “we’ve paid the money back”; while a Glasgow property developer claims a Labour MSP assured him he could donate even if he wasn’t on the electoral roll) that they’ve forced a catalogue of Labour failures off the front pages. The Government is falling apart. Not news to you? Fair enough; but I am talking, just now, about failures of its policy, not failures of its competence or honesty. I do realise it’s tough distinguishing all the areas in which this omni-challenged Government is failing, but bear with me. An earlier column, which I believe was pretty prescient, was called “Brown’s Bad News”. But today I don’t have to look into my crystal ball. I would rather invite ConHome readers to examine some of the recently announced Labour catastrophes they’d rather you overlooked. Louise Bagshawe wants clubs to protect travelers from football hooligans. It’s tempting to write another anti-Labour column today, but the words “fish” and “barrel” spring to mind. Instead I thought I might explore one aspect of the social responsibility agenda; what football clubs ought to be doing about hooligans on public transport. David Cameron’s early speech on flexible working suggested that politics had a duty to change the culture; to change how businesses contribute to society, other than making profits, through exhortation and not regulation. A light touch is the Conservative way. Certainly, Cameron has had great success with this; environmental progress like biodegradable plastic bags on the one hand, and national attention to the issue of sexualised children’s clothing on the other. On a morning when it looks likely that football will be hitting the headlines for all the wrong reasons, I thought we might examine ways to encourage football clubs to increase their sense of social responsibility. Football is a game at the heart of our national life. The legendary Bill Shankly once said “"Football is not just a matter of life and death: it's much more important than that". Back in the bad old days, of course, there were a few occasions when football hooligans regrettably did use the beautiful game as an excuse for their ugly violence, and made it very much a matter of life and death. Thankfully, those days have long gone from English football. But there’s still a fair way to go. And one way I think football clubs could show a strong sense of corporate responsibility is by contributing to prevent anti-social behaviour caused by fans after the game. I’m thinking particularly of safety on public transport. Louise Bagshawe argues that Brown and Darling must come clean with the public. Today is a special day in the LoCicero (my married name) house. It’s my daughter’s birthday, and it’s Thanksgiving. Since my husband and three children are Americans, we celebrate the holiday. Under ordinary circumstances, this column would have been an unfashionably warm tribute to our foremost ally and the second greatest nation in the world, the United States. But these are not ordinary circumstances. Labour is falling apart. It is catastrophic for the nation to have to be ruled by such a bunch of incompetents. A few weeks back, I was writing about the election that wasn’t on the day it ought to have been called. Back then all PPCs were lamenting that we’d have to wait another two years, or more, to get this government out. I am starting to wonder if that is accurate. I am starting to wonder if the government will not fall over this. Today there are multiple questions the Prime Minister and the Chancellor need to answer over successive policy disasters. Not all of them relate to Datagate. 1. Did the Chancellor mislead the House of Commons? “The British Banking Association said: "The BBA did not ask for more time and none of our members asked for more time." The Association of Payment Clearing Services, which manages the movement of money between banks, said: "We found out on Friday and were given until Monday to sort it out. There was no request for a delay." Cast your mind back to when David Cameron was first elected leader of our party. He did a number of things that shocked the media commentariat, and announced that he would be a new kind of Conservative. Of course, in his victory speech he said that he would act to end the scandal of women’s under-representation in the parliamentary party; and speaking as a beneficiary, I am grateful for that. But a few weeks later, he moved on to another sacred cow. He let it be known that he would not stop at reforming the police; and that acknowledging that they did a difficult job, a brave job in difficult circumstances, should not stop politicians from criticising and questioning them. One of the most heartening, bold, and potentially life-changing policies David Cameron has come up with is his pledge to give local people control over their police force. For one thing is certain. The police are a pillar of our society. And Labour has weakened that pillar. Under Labour, the police are centralised, ineffective, under-resourced, and politicised. The utter collapse of the police force is a national scandal. When I see Ken Livingstone and Jacqui Smith defend Sir Ian Blair, the poster boy for poor, politicised policing (try saying that after a glass of wine), it seems fitting; an execrable government defending the indefensible. Iain Dale and Guido Fawkes: No introduction needed:. Ben Brogan This guy is the ultimate Westminster insider. Gets poll news first. Usually doesn’t update in the early morning. Anthony Wells: Brilliant polling site. Constituency discussions on each individual seat. Again, commenters from across the spectrum but Anthony’s analysis is the draw here – that and the individual seat analysis, which is not copied. It’s a bittersweet day for me today. I’m off to David Cameron’s constituency of Witney, to attend a key speech. I have a book deadline, so will be writing in the back of the cab. In the morning I’ll be doing the laundry and getting the children off to school; my eldest needs to do his reading practice. All in all, for a candidate it’s just another Thursday. It might have been different. Wednesday night, when I’m writing this, might have been the most sleepless since the night before my wedding day. We would have started with a dawn raid in the constituency, been out knocking up pledges all day long, talking to tellers, co-ordinating an election day campaign. By the end of the day, my life might have changed; as a Tory PPC in a marginal seat, I might have been elected to Parliament. On Yellow Saturday (it seems like yesterday, doesn’t it?) I was election planning all day long with my very able young agent. We were on the phone to each other planning an election event when the texts started coming into the Blackberry – from Tim, from my Campaign Director, my regional director, various friends. As you were. Brown’s bottled it. I hope you will forgive the impertinence of a letter like this from a mere Conservative PPC. But when considering what column to write this week for this website, there was a single subject that suggested itself; to ask the three Labour MPs most respected by their opponents to consider defecting to our party. Obviously, all of you will have been plagued with the question many times before by journalists. Political parties are by their nature big tents; every MP, even candidates, will have to swallow the odd unpalatable thing for the sake of what they believe to be the wider good, otherwise we would have 650 parties in Parliament. It is quite understandable that all of you have felt that whilst you disagreed with Labour on some issues, taken as a whole, you wished to retain party affiliation. And then there is the childish point-scoring employed when politicians, as the common term has it, “defect”. The very terminology reduces what is often a profound political journey to a cheap card trick; a score for this or that leader against his enemy. I know, from the courageous risks each of you have already taken in your political careers, that you would find this extremely distasteful. In writing this article in the form of a letter, I do not intend such point scoring. My contempt for both Quentin Davies MP and for the Labour Party on the matter of his defection came precisely because it was clear he had not made such a journey. Aside from his heartfelt Europhilia, Mr. Davies had nothing about him that would commend him to the Labour Party were he not a walking opportunity to score anti-Tory points. He has voted against gay rights, been fined for animal cruelty and is a supporter of the death penalty; as far as I know, he has not resiled from these positions. It is unclear to me what political philosophy of Mr. Davies resulted in the offer of the Labour whip. Surely being a Eurofederalist is not enough in and of itself? Louise Bagshawe promises that Brown's signing of the European Constitution tomorrow is just the start of the fight. The unmissable, ultimate insider blog of Benedict Brogan, political editor of the Daily Mail, posted a key story earlier this evening. Tomorrow, in full defiance of his manifesto promise, Gordon Brown will sign the European Constitution. Spitting on the voters, whom polls show demand their promised referendum, Brown breaches the latest and most important of New Labour's promises. His strategy is clear; he hopes that the Conservatives will shrink from the fight, rather than expose old divisions over Europe; that the sham debate in Parliament (irrelevant once the Constitution is signed) will bore the voters to death, and that Murdoch, the Sun and the Mail and Telegraph will wave the white flag. When Brown became certain to succeed to the premiership, I was told by friends not to underestimate him. I responded that we ought not to overestimate him, either. Once again, on this issue, he displays the political tin ear that led him into the morass of the past month. Brown hopes, as Brogan reports, that by holding the election in 2009 he will maximise UKIP and split the Tory vote. He has utterly misjudged us. Yes, it is true that in the days of John Major, the party was split over Europe. "Big beasts" like Heseltine, Clarke and Patten, and the MPs that backed them, revered the European ideal. There was, at that time, a genuine Quentin Davies europhile wing of the Tory party. There is no longer such a wing. The talents and statesmanship of the "big beasts" are quite rightly revered. It was a masterstroke by Cameron to ask Ken Clarke to head the democracy taskforce, and his ideas for remedying England's democratic deficit with Scotland were wonderful. That is just one example. However, it is abundantly clear that today's parliamentary party matches the membership; we are not quite withdrawalists, but are root and branch Eurosceptics. We recognise the free trade benefits of Europe, the cultural and policing co-operative benefits, but we stick there. Mr. Brown believes that by signing the treaty tomorrow he will kick the issue into the long grass. He is wholly incorrect. David Cameron is the only party leader in the UK, present or future (do you hear me Nick Clegg?) who has publicly called for powers to be repatriated from Brussels to the UK. Ben Brogan sensationally suggests that Cameron will then fight a 2009 election on a platform of a "repudiation referendum" - not merely abolishing the Constitution, but upon the repatriation of sensible powers. Can there be any doubt that, coupled with clear reforms like IHT, such a manifesto would win the General Election? It will appeal to the Gisela Stuart patriotic left, the LibDem voting Eurosceptics in Devon and Cornwall who don't realise what europhiles they are, and ukip voters who, when the crunch comes, will not vote to let Labour in when the Tories offer the resolute alternative. Sovereignty strikes at our heart. Brown grossly underestimates how much. Tomorrow he attempts to surrender, without the permission of the British people, many of our rights to govern ourselves. But parliament cannot bind its successor; still less Prime Ministerial fiat. Labour has one vision of "Britishness", and it's embodied in the new wording in our EU passports. The europhile LibDems share that vision. Only the Conservatives like Britain just as she is; only we are comfortable in our own skins. Gordon Brown has shown his contempt for the Britain he bangs on about. And Labour has just lost the election. Louise Bagshawe reflects on her sheer pride at being a Conservative. Well, a week is a long time in politics, isn’t it? Last Wednesday I had to call Tim and beg off my column; I wasn’t sure if I’d ever get to write another. I cancelled three days in Blackpool, incurring a hefty pre-paid hotel charge, in favour of preparation for a snap GE. Plenty of candidate friends did the same. The polls were telling us that Labour had double digit leads. The blogs were full of Labour supporters crowing merrily. The media could hardly contain their glee. The Sun told us David Cameron had “three days to save the Tories”. “MISSION IMPOSSIBLE”, they said. Friends will bear me witness that I never quite believed those bad polls. They just did not jibe with the feeling on the ground. Labour has failed so comprehensively in Northants. I was knocking up and leafleting with our excellent candidate for Lloyds ward in Corby, Lynn Wilson, and we did not detect any surge of enthusiasm for Brown in this ultra-safe Labour bastion. But still, polls are polls, and whatever Brown chooses to tell the Lobby, all politicians take note of them. I cancelled Blackpool. I could not justify three days in the Imperial Hotel talking to friends and enjoying myself at fringe meetings when we could get campaigning done. It may not happen but Louise isn't taking any chances. Her column has rightly taken second place to her preparations for a possible November poll. After her column on why we should vote Tory, Louise Bagshawe embraces Gordon's Big Tent and offers some reasons why you should vote Labour in a snap election. Those xenophobic Tories insist that we should keep our manifesto promise and hold a referendum on the European Constitution. We all know this is a simple excuse for the people to say "no" to a treaty they are too stupid to understand. Labour will send the treaty through on a nod, give up our veto in 60 areas, surrender our seat at the UN, sign up to an EU president and foreign minister and make Giscard d'Estaing a happy man. Nation states are an outmoded concept anyway. Vote Labour - we always hit the targets. We've got targets for hospitals, targets for police, targets for the public sector. And that's more important than dinosaur concepts like "bobbies on the beat". Social cohesion? Community housing? An affordable NHS? Who cares, we welcome whatever amount of migration there is and hang the consequences. I thought I would take a break from politics for this column. In the middle of house buying, we are living in the Corby constituency in temporary rented accommodation and I am without the internet, so missed sending this in last week, the anniversary of September 11th, 2001. But the subject is seared on my memory and I still wanted to write about it. I was living with my American husband in a little village outside New York City. Sep 10th I'd had an appointment with my American publishers, which I forgot about, and so called them up to reschedule. Like most New York autumns, that one was gorgeous. Sep 11th dawned sunny. It was an important day; local election day. The morning papers were full of the coming tussle between Republicans and Democrats. I picked up a coffee and jumped on the Metro-North into Manhattan. When I got on the train, America was one way; by the time I got off, everything had changed. As we pulled in to Grand Central, there was an annoucement over the train system. "Folks, for those of you headed downtown there may be some delays. There's been an accident at the World Trade Center. A plane crash." Passengers looked at each other, dismayed. A plane crash! I think everybody assumed it was a small plane, or a glider, not a passenger jet. "Not sure what's going on," the conductor added. Louise Bagshawe salutes the new Sultan of Spin. So, Gordon Brown is a Thatcherite, eh? He admires the greatest living politician and he actually compares himself to her. This from the lifelong Scotland fan who famously declared that one of his favourite sporting moments was Gazza's goal against Scotland in Euro '96. You know what? There are a lot of people of Scottish descent living in Corby, the major town in my constituency. A town where Labour told civil servants with white collar jobs in one of the most deprived areas of Northants that they were, and I quote, too "white British" to meet government diversity targets. A town where low income people suffer from his scrapping of the 10% tax band. I intend using Mr. Brown's choice of Gazza's goal against Scotland in campaign literature. It matters here because it shows that Gordon Brown will do or say anything if he perceives it will get him a vote. Real Scotland fans will be unimpressed. This week we have seen a pathetic attempt to grab the initiative after David Cameron wiped out his (truncated) honeymoon. Gordon Brown is promising a new kind of politics whilst hanging on with bitten fingernails to true Blairite spin. First, he "recruits" disaffected Tory and LibDem MPs as advisers, claiming bipartisanship but not checking with the party leaders. Secondly, as with his contemptible claim to have loved a rival's goal against the team he's supported all his life, he dares to compare himself to the colossus of Margaret Thatcher, a woman he reviled throughout his political career. Thirdly, terrified he's had the shortest honeymoon since Jessica Simpson, Brown brought out some classic Blairite gimmickry - "citizens' juries", ie glorified focus groups, to make policy - and he'd announced citizens' juries 17 times already before today. Bottom line: Brown is not serious. He's a debate-ducking, Blairite-spinning, war-retreating, gimmick-loving politician. I can't pretend I'm too much of a football fan. But I watch when England plays, and I can say I never saw a goal against them that I enjoyed. Goes to character, Your Honour. Gordon Brown, down in the polls, too "frit" to debate Cameron or call an election, has shown this week who is the true chameleon. 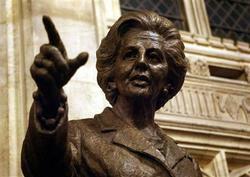 This tax-raising, Thatcher-loathing Europhile is not worthy to invoke the great lady's name. Call an election, Prime Minister. We want to fight one. Phony Tony has been replaced by Gimmick Gordon. Louise Bagshawe welcomes the Conservative lead on the NHS. For obvious reasons, it was very moving to be in Liverpool last week for the recording of Any Questions?. It is a wonderful programme that affords the panellist enough time to actually answer the questions put to them. Whilst I knew that the recording would concentrate on the unimaginable tragedy that had happened to Rhys Jones, it would touch on other issues too. You have a good guess at what might come up. That week the National Health Service had been much in the news, and the media spin was not wholly positive for the Conservatives. We had circulated a list of hospitals that were under threat. It contained one true error (the name of Altrincham hospital substituted for Trafford General, which is in the same NHS trust). A combination of media bias – the reporting of complaints by NHS Trust managers as though they were by definition justified – and unfortunate news management – Henry Bellingham MP apologising to his local hospital – led to a narrative of shambolic Conservative media controls and Tory fear-mongering on maternity and A&E. The fact that the protestations of the trust managers were often unfounded and that Bellingham had never said his own hospital ought not to be on the list, but rather, that other area hospitals should have been added to it as well, did not seem to matter. Never complain, never explain. On the AQ panel with me was Peter Oborne, the Daily Mail columnist. He gave a brave performance in the face of an unremittingly hostile audience and stood his ground on the issues. In an article last Saturday, Peter argued, as an aside, that Andrew Lansley should be sacked. I must disagree. Whatever the flaws of last week’s presentation, both our overall strategy on the NHS and the decision last week to highlight maternity and A&E closures are proving themselves justified. Moving house is always a stressful thing. In our case, we are this week preparing for a move into the constituency. I was always clear that being a parliamentary candidate meant total commitment to the area you hope to represent. Our family story is just one amongst thousands – Conservative activists giving up their time, knocking on doors, standing as local councillors, donating, writing to the local paper, marching for their local hospitals, serving in their Associations, even starting blogs! We are a team. And when we are united we are an unstoppable team. What motivates so many Conservatives to give of themselves in this way? I was never so proud to be a Conservative as when I watched our councillors in East Northamptonshire, who had been elected unopposed, donating days and evenings over several months, posting thousands of leaflets and knocking on hundreds of doors, to get their colleagues in Irthlingborough elected. My last several columns have concentrated on what the Government is doing wrong. You can hardly blame me – as a professional writer, how can I ignore that much rich material? But ultimately, we are the party of change, optimism and hope. It’s a slogan, sure, but it’s one I believe in passionately. None of the major parties have yet produced their manifestos, nor is this column trying to anticipate ours. But what I list here is already announced as policy. 1. We will stop Brown’s NHS cuts: Conservatives are committed to ending pointless reorganisations and waste in the NHS. Crucially, we are committed to defending district hospitals. Labour’s policy is to “rearrange” A&E and maternity services to glossy “supercenters” that may be miles away from where local people live. As a new mum and a voter, I am quite clear this policy is utterly wrong. It’s “Accident and Emergency”, not “Accident and Not that Urgent so Let’s Drive Forty Miles” Department. 2. We will demand a referendum on the EU Constitution: The most recent poll showed that 81% of the people and 57% of Labour voters demand the referendum we were promised before we sign over yet more sovereignty to Brussels. 24% of Labour voters were prepared to vote Tory over the issue. Yes, sovereignty is that important. We are the only Eurorealist party that can actually win. Vote Conservative, or vote to give up the veto in 50 areas, our seat at the UN, control over justice, control over immigration, and control over taxes. This was the subject of my first ConHome column. It matters to me. According to the polls, the rest of the country feels the same way. 3. We will scrap the Human Rights Act: Enough said. 4. We will abolish inheritance tax and look hard at cutting CGT, stamp duty on shares, and business taxation: I would rather tax pollution than enterprise or already-taxed family wealth. Damned if he does, damned if he doesn’t. That’s the dilemma for Gordon Brown as he considers whether to go for an autumn election. After eighteen months of seriously bad press for the Labour party, our left-leaning media are dizzy with joy at having a different story to tell – a shiny new Labour PM, Blair’s unpopularity eliminated, and, against the predictions of the pre-succession polls, a honeymoon bounce for Gordon. Now the commentators are thrilling to the thought of a snap General Election. Feed the numbers for the latest YouGov poll into Electoral Calculus, and Labour actually increases its majority – significantly. Maybe Conservative relief at getting rid of Teflon Tony with his sure electoral touch was misplaced. Maybe Gordon Brown, hitherto thought of as a liability (including by Cabinet colleagues) could actually match his feat and march Labour into an historic fourth term with an even larger majority than today. And then again – maybe not. I think of what’s coming down the pipe for Gordon Brown, and none of it looks good. More of that in a second. So should he go early? After all, a non-domiciled expat has just promised to solve Labour’s money problem. The polls offer him hope. Who dares wins, eh? But there are major troubles with the idea of an early poll. A friendly Guardian article, earlier this week, warned Brown against it. Electorates historically do not enjoy mid-term elections, and punish the men who call them. The last ICM poll asked who wanted an election this year, and 70% were against – of those, most were Labour voters. Gordon Brown, a keen student of politics, knows this full well. Labour is not organisationally ready – selections in key seats like Burton (where, based on outstanding local election results, they have scant chance of beating our outstanding PPC Andrew Griffiths anyway) are proceeding at a snail’s pace. They are broke – despite the promises, could enough cash be raised in time? And lastly, the internals of the polls, as pored over at politicalbetting.com this week by Mike Smithson, show the Tories are still net gainers over 2005 and Labour net losers. In a government of spin and soundbites, it was the most celebrated one of all. Blair promised us his priority was the education of our children. That struck a chord; the feckless Labour party of the past suddenly sounding responsible, and though it intended to deliver on the future of Britain. There’s a lot of competition for the title of “worst Labour failure”. Where do you start? If I were to go into every area of Labour failure, your eyes would glaze over. But today, let’s consider the claims of education. For the way Labour has betrayed our children is a complete scandal, and the compliance of the media in this betrayal only marginally less so. I was in the penultimate year that sat O Levels, and I didn’t do as well as I’d hoped. Two years later, my little sister sat the first GCSEs, and she got straight As. How I glowered with resentful envy. ‘Her exams were easier,’ I complained to my highly unsympathetic mother. That was the first year that ‘grade inflation’ was discussed. It has barely ceased to be discussed since. But under Labour, with its apparent commitment to education, the problems in our schools are endemic. Things are at such a pass that employers complain their workers are illiterate and innumerate; the great universities have no idea whom to admit, since A grades are so common; mainstream subjects that are the bedrock of a basic liberal education are under threat because of declining standards and easier options – subjects like history and French. Forty percent of our children not even up to speed on the basics. What do you reckon the figures are for the sciences, for history, for foreign languages? And how did the BBC report this staggering announcement? With full Labour spin as (ahem) “the best results ever” because these appalling figures showed a 1% improvement on the prior year. Louise Bagshawe: Stick with the leader. Stick with the strategy. Fight for the country. Replying to Stephan Shakespeare’s Monday Column, Louise Bagshawe argues that David Cameron is on track – and he shouldn’t change a thing. If you put yourself up as a Parliamentary candidate, people have a right to expect a lot from you. Commitment, for one thing. Effort, for another. And a willingness to put your head above the parapet. So I write this piece in the full knowledge that it will bring down the wrath of some ConHome commenters upon my head. My fellow columnist, Stephan Shakespeare, is almost completely wrong. He’s right that we don’t need to change our leader. He’s wrong, in that we also don’t need to change our strategy. It is both the right strategy and a winning strategy. This has been a week of dissent. Not from towering figures in the party, whatever the BBC would have you believe. But from a disgruntled candidate and a former donor who stopped donating prior to the last election. It doesn’t stop the BBC from relentlessly parroting the “top Tory donor” tag. Clue to editors: Lord Kalms hasn’t given this party a penny since 2004. A lady in my constituency who bought a five pound strip of raffle tickets last month is more of a “top Tory donor” than he is. More credibly, the former junior frontbencher, Graham Brady MP, also waded in, repeating the Labour line that David Cameron’s inclusive, green, eurorealist brand of compassionate Conservatism appealed only to the metropolitan elites and not to voters in the Midlands or the North. I found this line of attack curious, since it is so easily refuted. David Cameron was elected by over two thirds of the membership on just such a platform. One need only to read ConHome’s excellent archives to see the disquiet of the right during the leadership campaign that a centrist might get the party leadership. But the Tory members knew exactly what they were getting when they elected David.